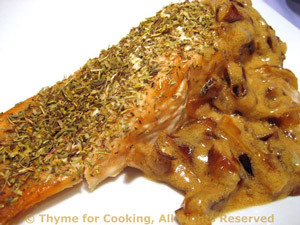 Baked Salmon, Creamed, Browned Onions, Thyme for Cooking easy fish main course. Salmon is a rich fish, full of heart healthy fats. The slightly sweet, slightly tart flavors of the creamed onions balances the rich taste of the fish. Brush salmon with 1 tsp olive oil. Sprinkle with herbs. Put salmon on a baking sheet and bake in 400F (200C) oven for 15 - 17 minutes, depending on thickness. Salmon will be done when it flakes easily, slightly pink in the center is fine. Peel onions, cut in half and slice. Heat oil over medium heat. Add onions and sauté until very tender and about half are well-browned, 12 - 18 minutes. Add white wine, chicken stock and scrape up any browned bits from the skillet. Simmer, uncovered, until only 2 tbs of liquid remains in the skillet. Remove salmon from skin if needed and place on plates. Spoon Creamed Onions on the side and serve.